Future Powertrain Conference 2019’s backdrop is global emissions reduction, efficiency and performance improvement within products for this generation and the next. It will provide industry and academia an opportunity to join minds to challenge future powertrain solutions. The conference mixes presentation and discussion to explore the very latest thinking and technology breakthroughs. This year Integral Powertrain’s e-Drive team will be talking electric motor technology when Jason King, Business Development Director, delivers his keynote speech during the first day. Jason will take the opportunity to discuss the motor and inverter technology that enabled so many records to be broken in 2018. He will present insights into the high performance motor and next generation silicon carbide inverter packages that powered the Volkswagen I.D. R race car. He will also touch on a successful ‘Track to Road’ programme that Integral e-Drive is using to deliver race bred technology to a wider audience. Examples are the Aston Martin Rapide E motors and the e-Axle marketed with partners McLaren Applied Technologies and Hewland Engineering. 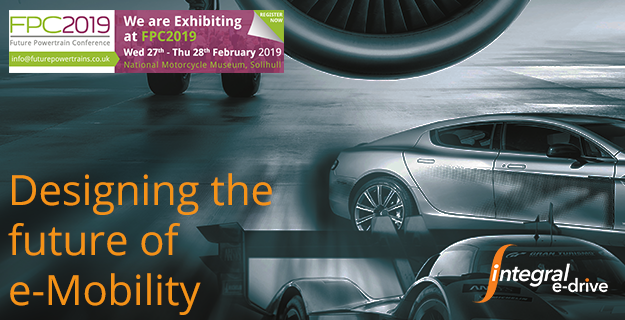 A small selection of example products from a range that includes extremely high performance electric motors, inverters and e-Axles for future motorsport and automotive will be on display. Integral e-Drive welcome the growing interest that they are receiving from industries such as aerospace who are working to meet the same challenges of performance, efficiency and environmental impact. Increasingly this event is attracting problem solvers from a wider range of industries that recognise the advances that motorsport and specifically companies such as Integral e-Drive are making. Be the first to see Integral e-Drive updates leading up to FPC2019 by following our social media channels or contact us directly. Register today for the Future Powertrain Conference.